Herta Zerna was born in 1907 in Berlin and she grew in a Social democratic family. When she was 14 years old, she affiliated to the worker youth. Soon her friends noticed her talent as a writer, so that she decided to start her studies as a journalist. 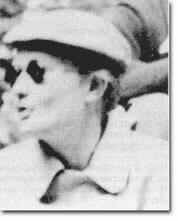 Since 1933 she was in contact with Social democrat and communist underground circles for which she was a messenger. For a certain time she also lodged political refugees. During the war, Herta Zerna worked as an editor in the radio. In 1940 she offered Margot Moses her help, when she met her at a friend’s house. In the spring of the year 1943, the young Jew went to her house and asked her for refuge. Herta Zerna hid her, sometimes in her apartment in Berlin, and sometimes in the houses of friends, and she got her a job as substitute stenographer at the ”house of the radio”, where she worked. Margot Moses received for this work a company ID and another one as messenger, with which she could pass the controls. On a journalist friend’s request, Herta also accommodated the Jew Susanne Meyer, who lived in the underground at a small rural house she had in a Brandenburg town. The bartender of the town, Georg Steffen and his wife Elise also helped Susanne Meyer, who survived the Holocaust. At the beginning of 1945, Herta Zerna also hid a coworker who had deserted the German army. This, at the same time, had collaborated in Margot Moses’ support by giving her his work office. Previous article: Martin Niemöller. Hero of the German underground resistance.